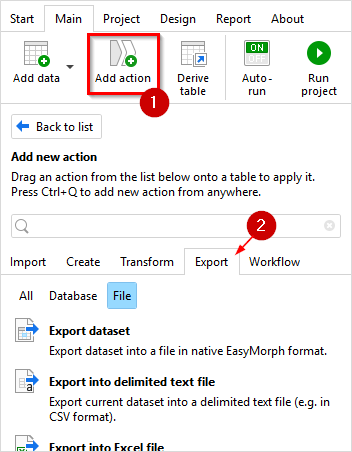 To export data from EasyMorph into a file use export actions, e.g. "Export into delimited text file". Export actions can be inserted after any other action. One project can have as many export actions as necessary. Note that export actions are not calculated automatically in order to avoid accidental changes in target files. To run not calculated export actions press the "Run project" to run all not calculated actions, or the "Run action" button to run only the selected action. Hint: Move an export action into a dedicated derived table to avoid blocking calculation of consequent actions in the Auto-run mode. It is possible to export the result of any action once without creating an export action. In the action context menu (invoked by right-clicking action), select "Send to file" and pick the desired file format. 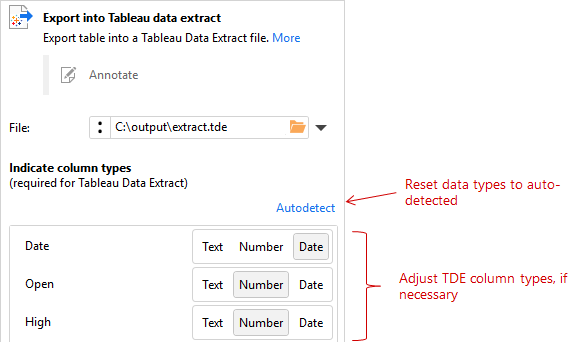 Exporting into a Tableau Data Extract (TDE) is different from other types of file export, because it requires specifying column types. EasyMorph allows mixing values of different types (e.g. numbers and text) in the same column, but in a TDE a column can store data of only one particular type. Therefore for creating a TDE every column must be assigned a type — Number, Text or Date. EasyMorph detect data types for all columns in a table automatically, although they can be adjusted manually, if necessary. Values of non-matching types are replaced with nulls. In version 3.6 and above you can publish data sources directly to a Tableau Server or Tableau Online. EasyMorph dataset is a file in the native EasyMorph format (.dset). It provides the fastest possible way to load data into EasyMorph. If your project frequently imports data from a large spreadsheet or text file, you can speed up calculations by exporting the contents of the spreadsheet or file into EasyMorph dataset once and then importing the .dset file instead of the original one. EasyMorph datasets can be conveniently published to and retrieved from EasyMorph Server. 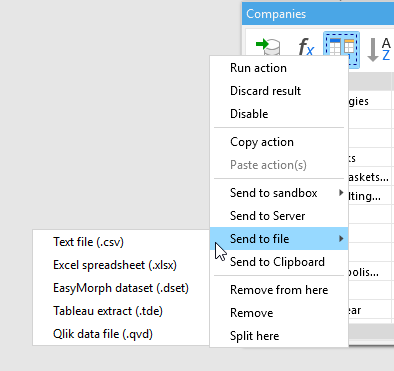 To publish the result of an action as a dataset to EasyMorph Server select "Send to Server" from the action context menu (invoked by right-clicking the action). To retrieve a dataset from the Server, click the "Add data" on the Main toolbar and select "Receive from Server". Using EasyMorph Server for storing datasets (and other data files) is a convenient way to store commonly accessed data and share/exchange results of calculations.